The significant differences in the socioeconomic and disease pattern (mode of presentation, stone bulk, health care delivery facilities) for urolithiasis in India make it imperative to formulate our own guidelines. Ministry of Health and Family Welfare, Government of India has issued the Standard Treatment Guidelines for Urolithiasis and ureteric colic. The recommendations drawn are largely based on the AUA/EAU guidelines with modifications recommended where appropriate. Indian references have been cited, particularly so, if they are prospective randomized studies and/or metanalysis. Recommendations have been given when adequate literature support is available. The referral criteria are noted when appropriate. A staghorn calculi is defined as a stone with central body and at least one calyceal branch. A partial staghorn calculus fills part of the collecting system. A complete staghorn fills all the calyces and the renal pelvis. Adult with a staghorn stone (non Cystine, non uric acid) who has two functioning kidneys (functioning both kidneys) or a solitary kidney with normal function. The patients overall medical condition, body habitus and anatomy should permit any of the available intervention (1). Non staghorn calculi Any pelvic and /or calyceal calculi which do not fit in the definition of staghorn calculi (2). Although a few studies have been reported for a small group of subjects in screening camps. The true incidence of urolithiasis in India is still not known. It is commonly seen in western states, hypothetically, attributable to high salinity of water .The presentation of a patient with urolithiasis differs in India. Large stone bulk on presentation is commonly seen in India. What should be the optimal? Imaging is absolutely imperative if, the patient has a solitary kidney or a history of fever. If the diagnosis of stone is in doubt then imaging is mandatory. (2) Execratory urography has been the gold standard in the work up for urolithiasis. Non contrast computerized tomography(NCCT) scan is quick and safe, contrast free alternative to excretory urography. Randomized studies have shown that non contrast helical CT has similar or superior results to excretory urography in acute flank pain(3) Contrast media should not be given or should be avoided when there is a elevated creatinine level, pregnancy or lactation(4)(5) Additional information can be gained by contrast enhanced CT scan(CTU), however at the moment there is no level 1 evidence to suggest that CTU is superior to IVU in the work up of urolithisis. .(6) . X-ray KUB and ultrasound is used by few clinicians as a measure of preoperative investigations, however this cannot be considered as a standard. These investigations help to plan access and predict the possible success rates. Recommendation:-Excretory urography is the gold standard in work up for urolithiasis and is mandatory in solitary kidney, history of fever and when the diagnosis is in doubt. NCCT is the investigation of choice in acute flank pain due to stone. Radiographic characteristics of the stone. Microscopic examination of the urinary sediments to detect crystals. Urine Ph (alkaline in infection stones and acidic in uric acid stones. Special investigations which are ordered on case to case merit are renal scintigraphy, antegrade, retrograde contrast study. When the stone diameter is more than 7 mm (because of low rate of spontaneous passage). When adequate pain relief is not achieved. When there is stone obstruction associated with infection. Recommendation:-For1, 2 stone removal with or without prior decompression(depending on the clinical situation) is recommended ,in situation ,3,4,5,6 emergency deobstruction of the collecting system is recommended. The choice of decompression can be with ureteric stents, percutaneous nephrostomy depending on surgeon preference, expertise and the level of obstruction. The success of lithotripsy depends on the body habitus, location of the stone, efficacy of the lithotripter, stone bulk. The contraindications for ESWL for renal stones include pregnancy, bleeding disorders, uncontrolled urinary tract infections, morbid obesity, aortic aneurysms close to F1. Routine use of stents is not recommended for ESWL for renal stones. The stone clearance is lower for stones in the lower calyx as compared to anywhere else in the kidney. Various studies have attempted to show the correlation of geometry of the lower calyx to predict the clearance of stone in this location. However the calyceal stone burden is the most important factor in predicting the clearance. Although there is no critical size, 20 mm should be considered the upper limit for stones in the lower calyx to be recommended for ESWL. The EAU guidelines recommend ESWL as the treatment of choice for renal stones less than 20mm2(300mm2) (2). A multicentre trial has compared ESWL and Flexible ureteroscopy for lower calyceal stones. It failed to show any difference in the clearance rates. The composition of the stone is an important factor for predicting the success rates of renal calculi. Specific stone compositions have different clearance rates because of the varying fragility of stones. Cystine stones are harder to fragment, hence cystine stones larger than 15mm should not be treated with ESWL.PCNL would be a good option in these patients(2) The measurement of stone density with NCCT helps in predicting success rates of ESWL. Stones with greater than 1000 Hounsfield units (HU) show poor results with ESWL. Simultaneous fluoroscopy and ultrasound monitoring is desirable. (2) The acoustic coupling between shock head and the skin should be optimal. Ultrasound gel is the best available gel. The ultrasound gel should be applied straight from the container rather than by hand.(15)(16). Level 4 evidence is available to suggest that proper analgesia results in limited movement and respiratory excursions. Better fragmentation can be achieved with starting the fragmentation at lower energy setting and then ramping up the power(17) . the manufacturers recommendation regarding the number of shocks and frequency should be followed.The optimal shock wave frequency is 1.0 Hz(18) It is important to limit the number of shocks and the power, due to concerns regarding damage to the kidney. In case of infected stones, antibiotics should be given according to urine culture sensitivity, the same should be continued after surgery for 4 days (2) Clinical experience suggests that stones in the ureter rather than the kidney should be treated with shorter intervals between sessions. It is recommended that stones smaller than 20mm2 to be treated with ESWL. Routine use of stents is not recommended for ESWL for renal stones.The contraindications for ESWL for renal stones include pregnancy, bleeding disorders, uncontrolled urinary tract infections, morbid obesity, aortic aneurysms close to F1. Antibiotics should be given according to urine culture sensitivity, the same should be continued after surgery for 4 days. The physicians should refer to the manufacturer recommendation regarding the decision of number, frequency and power of shocks. Technically most of the renal stones can be managed with a percutaneous nephrolithotomy. However the usual indications for PCNL are larger than 20mm2, staghorn, partial staghorn calculi and stones in patients with chronic kidney disease. General anaesthesia is preferable, although studies have demonstrated the utility of regional anaesthesia (19) PCNL has been performed traditionally in a prone position however it can technically also be performed in supine position, the advantage of this (supine position) approach is that the retrograde access is easier in supine position, anesthetist has a better control over the airway and simultaneous ureteric and renal stones can be managed without guided or fluoroscopy guided depending on the availability of instruments and expertise. The advantage of ultrasound guided access is the potential to avoid major visceral injuries. (22) The access site should be the posterior calyx. The tract should be the shortest possible tract from the skin to the desired calyx traversing the papilla. Depending on the stone configuration a calyx should be selected (Supracostal, infracostal or subcostal) so that maximum stone bulk can be cleared minimum number of tracts. (23) Renal tract dilatation either balloon, amplatz or metallic dilators are a matter of surgeon preference and availability (2). In lower polar stones ESWL, PCNL and flexible ureterorenoscopy are competing procedures with different success rates and complications (12)(24).In complicated cases or when secondary intervention is required a nephrostomy tube which serves the dual purpose of tamponade and a conduit for second look is placed. The patients should be counseled regarding the complications which are likely to be encountered such as life threatening bleeding with a possible need for angioembolisation or even nephrectomy. It may be associated with infective complications leading to urosepsis. The patients should be counseled regarding the possibility of residual calculi and the consequences thereof. The procedure becomes challenging in complex stones, although the complications are not specific to them. Such cases should be identified and managed by experienced surgeons. Technically, most of the renal stones can be managed with a percutaneous nephrolithotomy. However the uasual indications for PCNL are larger than 20mm2 , staghorn, partial staghorn calculi and stones in patients with chronic kidney disease. The access to the collecting system can be gained either ultrasound guided or fluoroscopy guided depending on the availability of instruments and expertise. Renal tract dilatation either balloon, amplatz or metallic dilators are a matter of surgeon preference and availability. In complicated cases or when secondary intervention is required a nephrostomy tube which serves the dual purpose of tamponade and a conduit for second look is placed. In uncomplicated cases, tubeless percutaneous nephrolithotomy with or without application of tissue sealants is a safe alternative. Flexible ureteroscopy offers a good treatment option for calculi less than 20mm in size. Due to improved technology and development in accessories and optics the role of flexible ureteroscopy is likely to be expanded in the future. The procedure wherein flexible ureteroscopy is used in the kidney is called as retrograde intrarenal surgery (RIRS). Flexible URS is not recommended as a first line of treatment for renal calculi. It has been demonstrated as a effective way of treating stones which are refractory to ESWL. It has also been seen useful when simultaneously used with PCNL, in this way it reduces the number of tracts during the procedure It is recommended that sterile urine should be documented prior to intervention. • Preoperative imaging helps to determine the size and location of the stone. • The use of safety wire is recommended (0.035 floppy tip) . advanced through a ureteral access sheath. • Small stones can be extracted with baskets of forceps. kidney, renal insufficiency, large stone burden residual stones. Flexible ureteroscopy offers a good treatment option for calculi less than 20mm in size. Flexible URS is not recommended as a first line of treatment for renal calculi. It has been demonstrated as a effective way of treating stones which are refractory to ESWL. Stenting after a uncomplicated ureteroscopy is optional.It is mandatory that sterile urine should be documented prior to intervention. ESWL should not be used as the preferred treatment modality for staghorn stones. Open surgery should be recommended only if the stones are not expected to be removed in a reasonable number of stages. PCNL is the first choice for staghorn calculi. Open surgery is desirable in the situation when expertise is not available wherein the stone can be cleared in reasonable number of stages and tracts. Nephrectomy should be considered for non functioning kidneys. The most common cause for ureteric colic is ureteric calculus. The priority in these patients should be relief of pain. The subsequent management of patients with ureteric colic would be determined by the level of obstruction and the stone size. It is recommended that pain should be relieved with diclofenac whenever possible. A alternative drug might be used if pain persists. Further more it has been shown that the resistive index significantly reduces if diclofenac is administered.. Level 4 evidence suggests that hydromorphine might be helpful, however there is a significant risk of vomiting (34) (35) (36) Diclofenac can affect renal function in patients with already reduced function. There is however no effect if the kidneys are functioning normally. Diclofenac sodium is recommended for the purpose. Studies indicate that the incidence of recurrent renal colic decreases with administration of diclofenac sodium. (38) When the pain is unremitting the treating urologist should think of alternative measures such as drainage by stenting or percutaneous nephrostomy or even removal of the stone. • Blind basketing without visualization endoscopically should not be performed. • Patients who opt for Medical expulsion therapy should have well controlled pain, no evidence of sepsis, and adequate functional reserve, such patients should be periodically observed for stone position and assessment of hydronephrosis. • Stone removal is recommended in persistent obstruction, failure of stone progression. or increasing or unremitting colic. • Patient should be informed about the available treatment options. 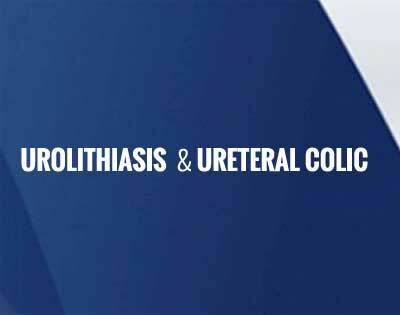 • URS is the preferred modality for distal and midureteric calculus. Alpha blockers are recommended for MET. It is recommended that pain should be relieved with diclofenac whenever possible. Patients with newly diagnosed stones less than 6 mm and well controlled symptoms, should be advised MET .Patients who opt for Medical expulsion therapy should have well controlled pain, no evidence of sepsis, and adequate functional reserve, such patients should be periodically observed for stone position and assessment of hydronephrosis. Both ESWL/ flexible URS are the preferred treatment options for upper ureteric calculi less than 1cm in size. For larger stones antegrade ESWL/PCNL/laproscopic removal are recommended depending on clinical situation expertise and instruments available. URS is the preferred modality for distal and midureteric calculus. Once symptomatic all these stones require treatment. ESWL, PCNL, laparoscopy and observation remain the treatment options which can be offered to the patient. As the drainage of the calyx in concern is at times questionable ESWL has rather poor results. Sometimes the combination this treatment modality is recommended. These group of patients include those patients with stones in ectopic, horseshoe or kidneys with fusion anomalies. The approach to managing these stones should be individualized. The factors to be taken into consideration are the stone bulk, the location of the stone, the vascular and the anatomy of the pelvicalyceal system. Ultrasound helps in gaining access in ectopic kidney apart from being a diagnostic tool. CT is pivotal in deciding the management and choosing the method of treatment in anomalous kidney..
1) Children have a tendency to pass larger fragments. In a developing country such as India, the cost factor plays a major role, which is mostly borne by the patient or a health care delivery mechanism, A study from India by Sinha et al , which although is a retrospective data and has a small sample size suggests that PCNL is less costly and as effective as open surgery. However randomized level 1 evidence by Al Kohlany et al comparing open surgery with PCNL suggests that PCNL offers equivalent clearance as open pyelolithotomy, with less morbidity, short hospital stay.and less renal damage. The trade off in a Indian clinical scenario will be to offer the best cost effective alternative available. See recommendation in section on- Nephrolithiassis –metabolic work up . The treating doctor ideally should be an Urologist or a surgeon trained in Urology. He is responsible for the initial workup of the patient and subsequent management of the patient. He is responsible for counseling the patient regarding the success rates, complications and possible outcome of any given procedure. All possible treatment options in a given clinical situation should be discussed with the patient. The patient on discharge should be given instructions for follow up and measures (dietary and pharmacologic) to prevent stone recurrence. Nursing and technical staff:-The nursing staff should be trained in the aspect of maintenance and use of endourologic equipment, considering the fragility and cost of these equipments. The responsibility of sterilization of these equipment lies with these personnel .The technical/nursing staff prepares the trolley and assists the surgeon during the procedure. The criterion for referral remains, lack of appropriate infrastructure and expertise at primary level. 2) Special situations such as pediatric urolithiasis, stones in ectopic kidney. 5Non progressive more than 6mm stone in the mid and lower ureter-semirigid URS.